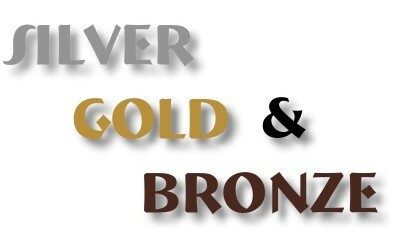 It seems odd that in Boy Scouts, silver always is a higher level than gold. We know that gold is a more precious metal than silver and in almost all other settings gold is the top award. So why is it different in Boy Scouts? Well the simple answer is that the order comes from how silver evolved as the higher recognition in our military. An explanation of the evolution can be read about on the below web page – blog.scoutingmagazine.org/2011/04/14/ask-the-expert-why-does-silver-outrank-gold-in-scouting-awards/. 1915 was the first year that silver cloth rank badges were issued for Second Class and First Class. Tenderfoot followed in 1921. These badges mostly embroidered in silver were used to signify the Scout's rank and the fact that the boy was a Patrol Leader. 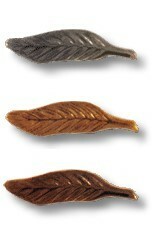 These rank badges were issued during a time in scouting when the highest rank was First Class. Life, Star and Eagle were considered honors not ranks. For this reason, a boy who earned the honor of Life, Star or Eagle and was Patrol Leader wore a silver First Class badge on his sleeve along with his honor award on his pocket. For more information about these early rank badges, please visit my web page titled – Boy Scout Cloth Rank Badges 1913-1925. 1920 was the beginning of the use of silver for Scoutmaster badges and gold for Assistant Scoutmasters badges. Silver was used both in the outline of the first class badge and for the Eagle on the badge. In a similar manner, gold was used for the Assistant Scoutmasters. The use of silver and gold continued until 1989 when the color designation was stopped. The name of the position had been part of the badge beginning in 1970 so the color did not play an significant part. For more information about the early Scoutmaster and Assistant Scoutmaster badges, please visit my web page titled – First Class Scoutmaster. 1920 saw the change in other scouting position badges also. Prior to 1920, position badges were embroidered First Class emblems of different colors to signify their position. Between 1920 and 1938, the positions in scouting was determined by the color of the badge's background, outline, eagle and wreath. The outline line, eagle and wreath were either gold or silver. As a general rule, the more silver on the badge, the higher the position. Although this continued for many of the badges after 1938, the rule became less and less pronounced. Today, we still have gold and silver on different Commissioner and Executive position patches but in general, those colors do not signify position levels. A Guide to Dating and Identifying Boy Scouts of America Badges, Uniforms and Insignia (4th edition) by Mitch Reis. 1927 was the introduction of Eagle Palms. Following the scouting convention of silver being the highest, the order of the palms was bronze for 5 merit badges beyond that required for Eagle, gold for 10 additional merit badges, and silver for 15 additional merit badges. The first arrow point for Wolf, Bear and Lion has always been the Gold arrow point and all succeeding are Silver. In some respects, one might think that since Gold is on the top, it has the most significant. However, since it is the first, it is considered the easiest and succeeding points are more difficult. This implies Gold is the easiest and Silver is more difficult. Cub Scout Rank Badges 1930 - Present. 1948 was the change in badge design for Junior Assistant Scoutmasters. The border of the new badge was stitched in brown or bronze. The brown border stayed with several badge changes until 1972 when the border was changed to white. For more information about the youth Troop Leader positions, please visit my web page titled – Did You Know?. 1949 was when the Senior Scouting program changed to Explorer Scouts and a new series of ranks called Bronze, Gold and Silver were created. These ranks continued until 1958 for Explorers and 1965 for Air Explorers. Like Boy Scouts, Advisors wore badges with silver embroidery and Associate Advisors wore badges with gold embroidery through 1958. For more background on the early Explorer program, visit - www.seniorscoutinghistory.org by Michael Brown. 1981 was when fashion designer Oscar de la Renta designed the Scout unifomr to be more stylish. The change included adding colored shoulder loops to the uniform. District and Council Scouters wear silver and Regional and National Scouters wear gold. Scouts and Scoters wear shoulder loops to indicate the branch of Scouting to which they belong. In terms of hierarchy, the fact that silver is worn at the council level and gold at the national level may seem that this is a case where gold is higher than silver but for the most part, Council Scout Exectives have the final say. For information about the history of Scout Uniforms, visit – www.troop97.net/bsahist3.htm. 1989 was when the Distinguished Commissioner Award was introduced. The award uses silver, gold and bronze plaques to recognize the three levels of the award. Silver for Council Commissioner service; Gold for District, Assistant District and Roundtable Commissioners; and Bronze for Unit Commissioners. For information about the Distinguished Commissioner Service Award, visit – www.meritbadge.org/wiki/index.php/Distinguished_Commissioner_Service_Award. 1998 was the introduction of the Venturing program. Like when Explorers began, Venturing is using the recognition awards of Bronze, Gold and Silver. For information about the Venturing Awards, visit the Venturing Awards Star in my Venturing Notebook. What appears to be an exception is is that the Distriguished Eagle is gold and the Eagle Scout medal is silver. However, The Distinguished Eagle is an award, not a rank. The first such award was presented to honor President Gerald Ford, the first Eagle Scout to become President. The "ranks" for adults were discontinued in the early 1960's (when adults could still earn Eagle). For more information about the Eagle Scout medals, please visit my web page titled – The Eagle Scout Medals. For more background on the Distinguished Eagle award, visit – en.wikipedia.org/wiki/Distinguished_Eagle_Scout_Award. For more BSA Scout History, please click the Home button in the upper left corner of this web page. If you have more examples or information, please send Craig Murray an e-mail and add more to these scouting facts.